Robert Altman and Paul Newman team up to give us some revisionist history about America’s greatest hero, Buffalo Bill. Mind you, I have no idea what Buffalo Bill ever did that was so dang great. I’m guessing that he killed some buffalo and Indians or something back in times when that sort of thing could pass for an occupation. The legend of Buffalo Bill seems to have been created mostly by Ned Buntline (Burt Lancaster), an author of dime novels and when Bill and Buntline got crossways with each other (that’s how we say it on the prairie) Bill simply started writing his own dime novels, romanticizing all the things he did. 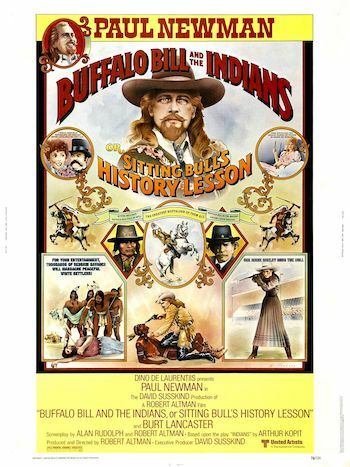 Altman uses Buffalo Bill’s story to illustrate America’s desire to invent its own past (since it has relatively little of it compared to places like Europe and Asia) as well as the fact that we have a desperate need to make our heroes into celebrities and force them to live a bigger-than-life persona that no one could possibly inhabit for any amount of time without being utterly destroyed as a person. Altman’s premise is an enticing one: show us what Bill was like through the prism of the show business machine and what happens when he signs up his former foe, Chief Sitting Bull, for a season at his Wild West Show in an effort to boost returns at the box office. Throw in the fact that the creator of the Buffalo Bill legend, Ned Buntline, has shown up and is hanging around just adds to the possibilities. And for the first part of the movie, everything plays out as you would hope. Paul Newman, like Buffalo Bill, is a natural star with his rascally smile and piercing eyes and you can’t help but be held enthralled whenever he’s on screen doing something wacky. The movie is at its best when it plays with movie-western stereotypes we’ve all been raised to expect. After Sitting Bull (through his right hand man, Halsey) gives Bill some spiritual mumbo jumbo about the leaves and stuff, Bill fires back something along the lines that it don’t matter much about the leaves so long as he knows which way the wind is blowing, then whispers to one of his men that he was just giving some of that “murky logic” back to Bull that he gave him. Eventually though, the movie doesn’t generate much in the way of laughs or for the matter anything in the way of interest, at least until the closing moments. The problem is that for the middle of the movie, Altman seemed to lose track of the point he was making and got swallowed up by the story and the impenetrable machinations of Sitting Bull. If Altman manages to demystify Bill and the whole idea of the frontier hero, then he doesn’t do much with Sitting Bull or the Indians. Sitting Bull proves to be a problematic performer making a bunch of demands and saying that he will do the show only because he had a dream that he would meet the Great Father (President Grover Cleveland) by signing up with the show. There are a few bumps along the way where Bull usually ends up outsmarting Bill and Bill manages to convince himself that it was in fact he that had outsmarted Sitting Bull all along. Sitting Bull’s dream comes true and he finally gets to meet the president. He wants to ask Cleveland to do something for his people, but Cleveland won’t even listen to the request. Sitting Bull leaves and the next thing we know, he’s been killed at Standing Rock. The only thing that comes from this is that it causes Buffalo Bill to have a drunken vision of Bull hanging out in his house with him! Bull sits there silently as Bill wanders around his house (more of a trailer – they are on tour after all) and bemoans the nature of celebrity. You’re tempted to tell Bill that he got exactly what he deserved. You wanted to be famous, you were complicit in this process and tried to live the legend, knowing full well it was all a bunch of buffalo chips. Now that you’re trapped by your own fame, you’re crying because you’re suffocating beneath everyone’s expectations? Well, I’m not RSVP-ing your pity party pal! Bill, though a showman, is still a human being, and he knows that all these people are living vicariously through him and the worst part of all is that the life they’re living vicariously through him never really existed at all. When Buntline and Bill finally meet near the end of the film, they don’t say much and Bill says he’d love to have him back at the show, but some of the others don’t like him. They both know it’s really Bill who couldn’t stand to have him around. Who wants to have this guy remind you every single day that everything you’re doing, everything everyone is lauding you for, is completely false? When Buntline leaves the saloon, he tells Bill “it was pleasure to invent you.” Confronted by the reality of his origins in his meeting with Buntline and the realities of the West in his dream with Sitting Bull, what does Buffalo Bill do? The next thing we see is him at the show performing with Halsey playing the part of Sitting Bull (dressed up in big headdress and war paint) in a ridiculously fake fight where he ends up killing Sitting Bull raising his headdress triumphantly for the adoring throngs! American heroes may be tortured souls, but the show must go on, especially when that’s all that you know. Never as funny as you would hope it would be (probably because you suspect there’s a lot of truth to things here) and rather aimless in the middle, the movie is worth looking for because of Newman and the fact that the themes of our country’s need to worship famous people and to constantly re-write the recent past to our liking are just as relevant today as they were when this movie was released (July 4, 1976 – take that America!) and when the movie takes place. Like the hero it portrays, the movie is a flawed, but interesting take on the beliefs of this country, both perceived and real.